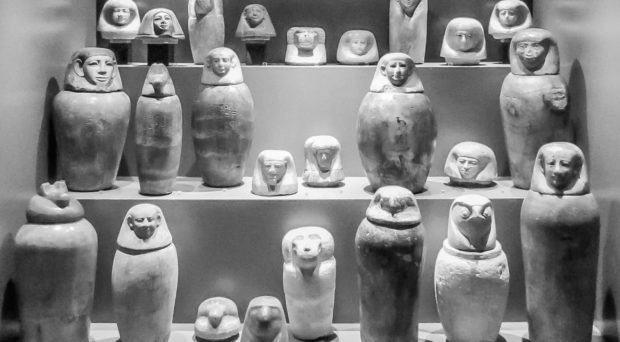 Ancient Egyptian canopic jars on display in the Egyptian collection of the Archaeological Museum in Zagreb, Croatia. This blog has been crossposted from the SpringerOpen blog. The Canopic Jar Project, funded by the Swiss National Science Foundation, is the first in the world to investigate a large series of ancient Egyptian canopic jars from European and American museum collections in a truly interdisciplinary research environment. The inventive focus on the contents of canopic jars produces results unobtainable by conventional ancient mummy research methods. The project involves macroscopic, radiological, chemical, and paleogenetic studies of ancient Egyptian canopic jar contents and mummies based on prior Egyptological assessment. The ancient Egyptians embalmed the bodies of the deceased due to their belief that the soul, travelling outside its carnal envelope, had to be able to return to it. A post-mortem preservation of the human body was therefore essential for the survival of the soul in the afterlife. The viscera, on the other hand, had to be extracted from the body to avoid its decomposition, but also needed to be preserved. Certain internal organs of the deceased were kept inside vessels called canopic jars. Although funerary practice and the design and use of canopic jars changed significantly from a first experimental phase in the Old Kingdom (c. 2700-2200 BC) to its peak in the New Kingdom (c. 1550-1077 BC) and the 3rd Intermediate Period (c. 1077-652 BC), typically a set of four canopic jars, each dedicated to the safekeeping of one particular organ was used. Mostly made of alabaster or terracotta, 30-40 centimeters in height, many jars feature lids, of four possible types, indicative of their contents: a human head for the liver, that of a baboon for the lungs, a jackal for the stomach, and a falcon for the intestines. Canopic jars were placed near the sarcophagus, inside the funeral chambers. Jean-François Champollion (1790-1832), the French linguist who had deciphered the Hieroglyphs on the Rosetta stone, seems to already have discovered their use in 1812, but the study of their contents is only very recent and few canopic jars have been analyzed to date. For a long time they were mainly considered from an artistic point of view. Three-dimensional surface reconstructions and volume calculations of a canopic jar. “Surprisingly, ancient Egyptian canopic jars – containing precious mummified human internal organs – have been widely neglected in biomedical research so far. This despite their unique value to contribute to the understanding of the ongoing evolution of diseases”, says Prof. Frank Rühli, Director of the Institute of Evolutionary Medicine and senior author of this study. The advantage of examining ancient Egyptian canopic jars is that it frees scientists to some extent from ethical constraints linked to the invasive study of ancient Egyptian mummies, therefore opening up several fantastic areas of exploration. The medical field will benefit from advances in the understanding of pathogen evolution, while genetic fingerprinting and pathogen identification are of vital importance to increasing our understanding of health and social structure in ancient Egypt. Opening them [canopic jars] may induce oxidation of contained biological tissues, or even contamination by bacteria. Yet, the number of canopic jars with preserved contents suited for such studies is not infinite. Opening them may induce oxidation of contained biological tissues, or even contamination by bacteria. To avoid wasting such unique study material, one step involves the use of recent medical imaging techniques to look inside the canopic jars: planar x-rays, computed tomography (CT) and magnetic resonance imaging (MRI). For the first time, these three standard clinical imaging modalities were compared to research the content of ancient Egyptian canopic jars. We explored the general feasibility and diagnostic sensitivity of the three main state-of-the-art diagnostic methods in paleoradiology as applicable on such unique samples. Unexpectedly, radiological analysis also led us to socio-cultural findings: Contrary to Herodotus’ texts, which represent some of the oldest sources on ancient Egyptian mummification procedures, probably not entire organs were kept in the jars, but rather small organ fragments. Most measured canopic jars showed insufficient holding capacities for an entire human organ, even after desiccation. This discovery is of substantial significance: It may not be the organ itself that the Egyptians thought to find in the afterlife, in a figurative way, but rather its presence. This could mean, that death and the hereafter were comprehended at a different level of abstraction than previously thought. However, this remains to be confirmed.